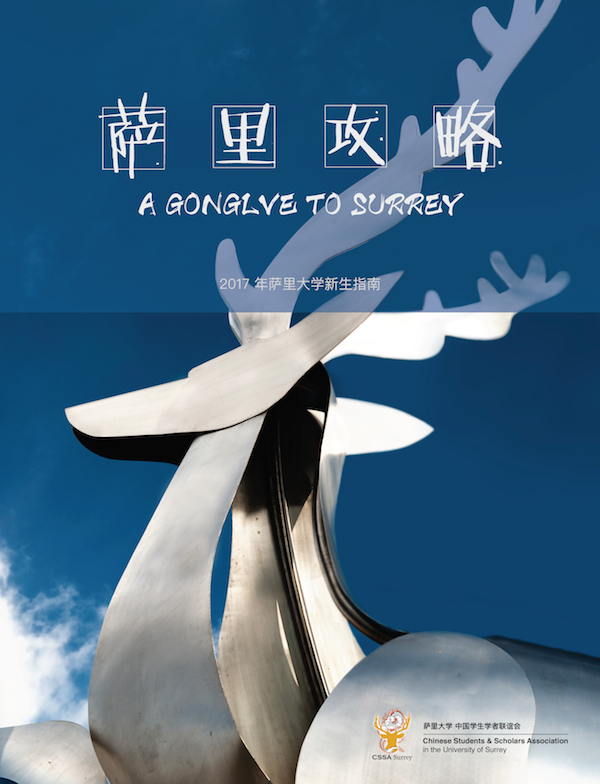 Hi, my fellow Surrey friends! Sorry for my absence during the recent months. I was quite busy with my own research (and I found a job!). Now I am back on blogging. I know this may be the first time to live in the UK for some of you. How do you feel now? Excited? Hopefully not frustrated or scared; even if so, don’t panic, everything will be alright. We are here to help you. Earlier this year, I wrote a guide to the Surrey freshers, with an unsurprising name of “A Guide to Surrey”. Honestly, it was quite difficult to write such a thing (cost me roughly three months from beginning to finish! ), and I only managed to write the Chinese version. If you know how to read Chinese (or want to learn to read Chinese), I will provide the download link later on this post. Considering Chinese is a quite complicated language and many of you cannot read it, here I will also provide some of the content from the guide. Where we are: University of Surrey located in Guildford, a peaceful town in Southeast England, roughly 30-40 minutes away by train from central London. It can be easily approached from both London Heathrow Airport and London Gatwick Airport. Guildford: a historic town, small but fully functional. The High Street is a fantastic place for shopping with brands covering all price range. There are also restaurants provide cuisine from all over the globe. How to get to the campus: we have a brilliant Meet and Greet team! (and I am one of them) M&G team will wait for you at both Heathrow and Gatwick airports and will provide free transportation all the way to the campus. If you have missed the M&G dates (which is almost certain when you read this post), just call a Uber. It should cost ~£40. What to do after arriving at the campus: pre-registration online and registration at the University Hall, register with the police if you are certain nationalities (Chinese for instance), register with a GP, open a bank account. If there is any step you are not clear, just go to the Student Service Centre, they will be happy to help. Transportation: travel a lot by bus? You can buy a bus travelcard for unlimited bus travels at a student discounted price. Travel a lot by train? Apply a 16-25 railcard as soon as you can. It costs £30 per year but will save 1/3 for any journey you have on a train. Sport: don’t forget we have a fantastic Surrey Sports Park right on the campus! It’s about 5 minutes away from Manor Park campus and 15-20 minutes away from Stag Hill campus. (Living at Hazel Farm campus? Don’t you worry. You can use your compulsory bus travelcard to get there. There is a bus stop just in from of SSP.) As a Surrey student, we can get a full student off-peak membership at £185 or a full student membership at £235. It’s a bargain if you have experienced the facility quality. Super. There are also many other things on the guide. If there is anything you want to know but I haven’t included here, please just leave me a comment.